Are you struggling to create decent looking pages on your website? Or feeling so frustrated that you’re considering hiring a web designer? Thrive Architect, the new WordPress plugin from Thrive Themes could be the answer to your problems. In this review, we’ll take a look at how easy it is to create visually impressive pages (and posts), without wasting a load of time and money. Creating pages with the WordPress editor is like going to the dentist. You never know how it’s going to turn out. At best, it’s an anxious wait. At worst, it’s painful. While WordPress is a great blogging tool, it was never intended to build professional looking web pages. It’s something the WordPress developers are looking to address with their Gutenberg project. Meanwhile, you need a WYSIWYG editor that let’s you build pages painlessly. Thrive Architect is a visual page builder plugin for WordPress that helps you create great-looking, conversion-focused pages. It’s the fastest and most intuitive visual editor for WordPress. The idea is to let you build your pages as fast as possible using the drag-and-drop editor so that you don’t spend endless hours fiddling around with shortcodes, CSS and HTML. Create a Homepage using one of the pre-designed Templates or adding elements like Icons, Buttons or Columns to your current theme. 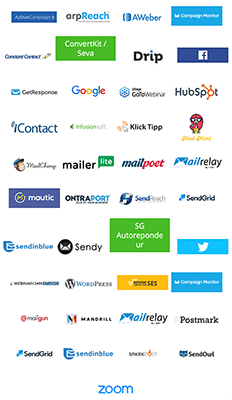 Build Landing Pages with built-in Lead Generation elements to help grow your mailing list. Format Blog Posts with features like Content Boxes and Styled Lists to make them stand out from the crowd. 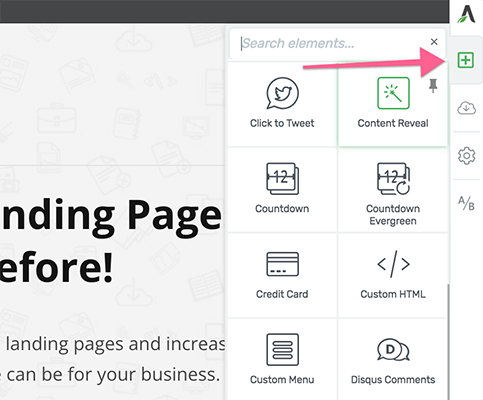 Create Sales Pages, Webinar Pages, Product Launch Pages, and more. 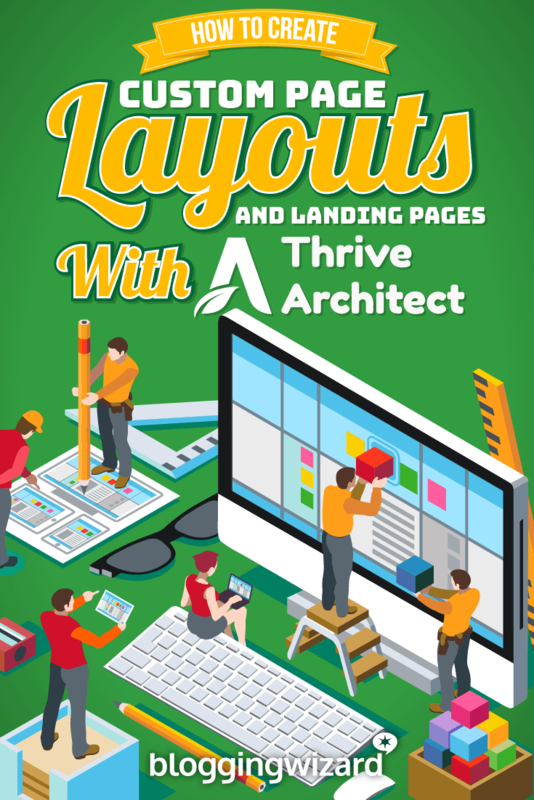 There are two ways to build a page with Thrive Architect. You can use a pre-designed Landing Page Template, or you can start from scratch with a Blank Template. Both ways are valid. You just need to decide which one you want. 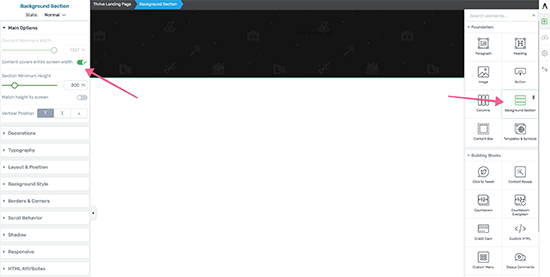 At the top of the Page is the default header menu and page title that you’d expect to see from your theme. Click on the ‘+’ button icon on the right-hand side of the page and the Thrive Architect menu will appear. So, let’s take a look at how that works. Thrive Architect includes hundreds of pre-designed landingpage templates. The beauty of these pages is that you could almost publish them straight away. You’ll have to dive in and edit the copy to suit your business, but at least you have the foundation for a quick start. By clicking on the ‘cloud’ button icon a template window will appear. 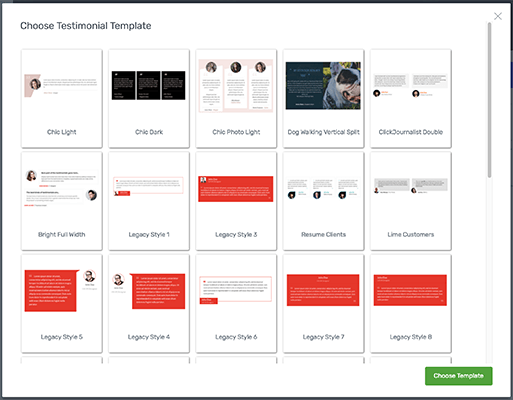 Thrive groups their Landing Pages in Template Sets. At the time of writing, there are 40 Landing Page Template Sets in their library, with more coming soon. Each set of pages uses the same design components to create a consistent look-and-feel. Once you’ve chosen a Landing Page Template, you can start customizing it with the WYSIWYG visual editor. Each page consists of elements; for example, Heading, Text, Button, Icon, etc. As soon as you select an element on the page, its editing options appear in the sidebar menu. Note: Thrive Architect labels the element in several places on your screen, so you can be sure you’re editing the right content. In just a few clicks you can adjust the page to fit in with your style and branding. Plus you can save your version of the template to use again. What’s important to remember is that all of these changes are immediately visible on the editing screen. You can switch to preview mode if you wish, but there’s really no need as you can see everything right in front of you. Thrive Architect is a genuine WYSIWYG visual editor. Sometimes it’s more appropriate to build your page from scratch, starting with a clean canvas. For instance, you may like the design of a page you’ve seen on another website and decide to have a go at building something similar. Let’s take a look at three of the powerful and flexible design elements you can use to build your page. 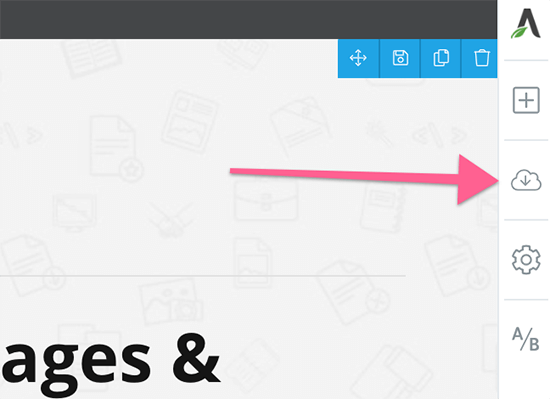 Adding a full-width background might not seem like a big deal, but you won’t find this feature on all page builders. The key setting here is the “Content covers entire screen width” as it allows you to have a full-width background no matter what WordPress theme you’re using. There are a couple more settings that I’ve used to create this background. First, I’ve added an image as a base layer and then I’ve applied a solid color layer on top. This helps when you want to start adding text like the heading below. You can add as many layers as you like to create the effect you want. Other layer options include a gradient color, a pattern, and a video background. Once you have your vertical split layout, you can add different content elements. For example, you could have image and text, video camera and video screenshot, plus many other combinations. The Content Box is a dual-purpose design element in Thrive Architect. It serves as a content container for holding multiple elements you want to treat in the same manner, plus you can use it to highlight important parts of content. But, using the drag-and-drop handle, you can move the Content Box onto the background section. When you’ve created a content box that you think will be useful again in the future then Thrive Architect lets you save it as a Content Template. It’s all part of their Rapid Implementation ideology. Chic Light uses two columns for the Image and Text. You can drag-and-drop the column widths to fit your image and text as you wish. The right-hand column contains two Text/Paragraph elements, each with a different font and size. Whilst the left-hand column has three Icon/Image you can edit. 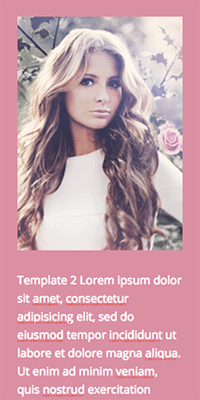 Using this template you can change column widths, colors, images, icons, positioning, and more. 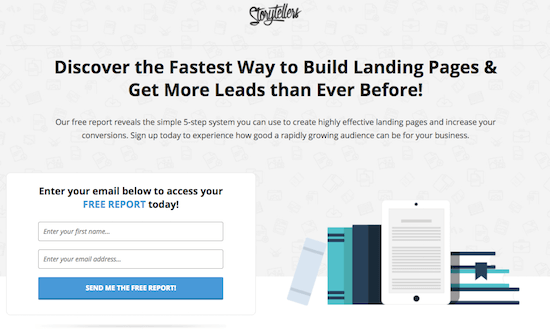 Most landing pages have one goal in common: to generate leads. Thrive Architect has two types of lead generation that you can use on your landing page. The default Lead Generation method is the 1-Step Opt-in. If you’re creating your own landing page, you can drag-and-drop the Lead Generation element from the sidebar onto your page. You can choose to stack the fields vertically or have them running horizontally. Plus you can customize other features like colors and text. The second Lead Generation method available in Thrive Architect is the 2-Step Opt-in, which uses the built-in Thrive Lightbox feature. Like all pages in Thrive Architect, you can customize the Lightbox design with the visual editor. 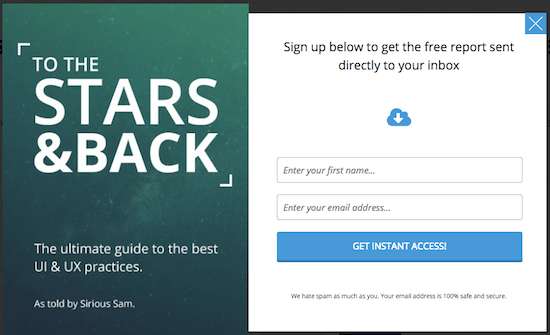 Whether you use the 1-Step or 2-Step method to capture email addresses, you’ll need to connect the Lead Generation form to your email service. Every page you build with Thrive Architect, whether you start from scratch or use a template, is mobile responsive. But the plugin has three extra mobile responsive features that help you build unique pages. For any element, or any Content Box with multiple elements in it, you can decide whether it will be shown or hidden. 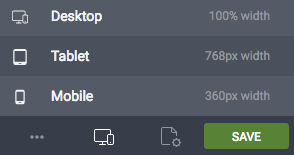 In this example, you can see that the Icon element will be visible on Desktop and Tablet, but hidden on Mobile. As more and more people are browsing the web with a mobile device, it makes sense for your site to be mobile responsive. With Thrive Architect, you can provide the best experience, regardless of screen size. You’ve already seen many of the main page building elements in Thrive Architect. But let’s take a quick look at a few more. Styled Lists – Use bullet point lists with custom icons and styling to present your selling points concisely. Content Reveal – Hide content blocks until a certain amount of time has passed. Perfect for sales videos, where you can reveal the purchase button when you reach the “pitch” part of the video. Credit Card Icons – Fully scalable credit card icons give your visitors a clear signal for a purchase and create trust. Click to Tweet – Encourage social sharing within your content. Google Map – Embed a Google Map on your site; great for local businesses. Post Grid – Display a grid of blog posts or WooCommerce products. Social Share – Add social share buttons and choose to hide share counts until above a certain number. Table – Take advantage of the intuitive HTML table builder and editor. Table of Contents – Automatically generate a table of contents for your page with anchor links that jump to each section. Video – Embed YouTube, Wistia, Vimeo or self-hosted video into your page. WordPress Content – Convert existing WordPress content into Thrive Architect content and manage it inside a self-contained block. You can get Thrive Architect for a one-time fee of $67. The price includes 12 months support with the option to renew each year, but you always get unlimited updates. Alternatively, try Thrive Membership for $19/month, which includes all the current and future themes and plugins from Thrive. Thrive have released an add-on to Thrive Architect that allows you to run a/b split tests without messing around with any code. It’s called Thrive Optimize. Running split tests means you can test to find what converts best on your landing pages. This means you’ll get more conversions and ultimately more customers. Click here to find out more about this add-on. Since this add-on only works with Thrive Architect, you can buy both as a bundle using the link above. But if you already own Thrive Architect, there’s an option to buy just Thrive Optimize (the link for this is just below the pricing table). Having pioneered the page builder market with Thrive Content Builder in 2014, Thrive has set a new benchmark with Thrive Architect. The new visual editor is both intuitive and fast. And the results are impressive. Creating beautiful, engaging and visually striking content in WordPress has never been easier. Disclosure: This post contains affiliate links. This means we may make a small commission if you make a purchase. This doesn’t cost you any more but it does help us to continue publishing helpful content – thank you for your support! Some of the Landing Page Templates look a little dated. Not all of old elements from Thrive Content Builder are present in Thrive Architect yet; for example, CTA’s, Pricing Boxes, and Guarantee Boxes. Summary: Thrive Architect is perfect for anyone who wants to build custom pages and make their content stand out. 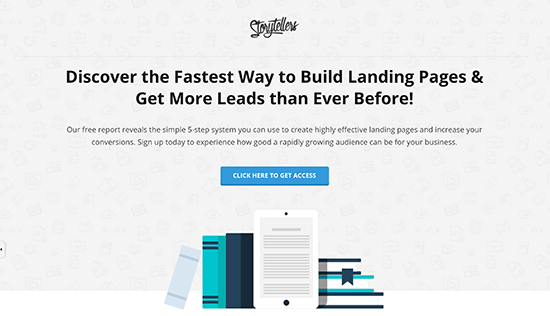 Use it to create landing pages, squeeze pages, sales pages and more – it’s fast and efficient. Want to grow your blog 425% faster? Newsletter subscribers get FREE access to 15+ guides, templates & checklists to accelerate your blog's growth. Includes Email Updates. Unsubscribe Anytime. And get FREE access to 15+ guides, templates & checklists to accelerate your blog's growth.